Altmetrics are a kind of non-academic 'cousin' to bibliometrics. That's not to say that they are any less important though. Instead, they have a unique purpose. They should be considered a useful addition to bibliometrics, as opposed to a replacement. Altmetrics show you how research has been covered by the mainstream press, discussed on blogs and distributed via social media across the world. Perhaps more importantly, altmetrics can also show how research has been adopted by industry and influenced policy. This can provide a fascinating insight into how research has made it's way out of the academic realm and entered the real world. While reading this page, it's worth remembering that the term 'altmetrics' kind of under-sells what they can do. While they can indeed tell you quantitative metrics about how many times a research article has been mentioned in the press for example, they can also give qualitative details of exactly which media outlets have covered the article or who has tweeted or blogged about it etc. To get a flavor of how this works, you may like to take a look at the top 100 Altmetrics articles. Who are the main providers of altmetrics? How can I look up the altmetrics for an article? How can I look up the altmetrics for a group of articles? How can I use altmetrics to look up policy and patent influence? What should I be careful with when dealing with altmetrics? There are two main providers of altmetrics. One of the providers is actually called Altmetrics and the other provider is called Plum Analytics (see the picture below). While they offer similar functionality, Altmetrics provides an overall 'score' of attention. As discussed below, some caution should be taken when using this overall score. You can look at the article or book record on the publisher's website. Different publishers use different altmetric providers (ie. Altmetrics or PlumX), but you're essentially looking for one of the icons shown above. 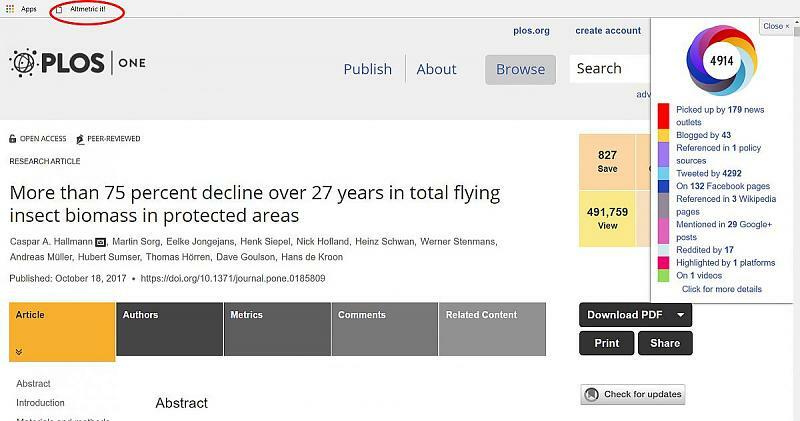 You can then click on 'plum print' or Altmetric's 'donut' icon to get specific details about exactly which news stories have mentioned the article, who has shared it on Twitter etc. However, publishers sometimes opt to not show the above icons, which can make looking for the metrics tricky. So it is often easier to install the bookmark tool (below). Go to the bookmarklet page, then scroll down until you see a blue 'Altmetric it!' button. Then drag-and-drop it onto your browser toolbar. (You may need to make your bookmarks bar visible first). This adds a small button to your browser (see icon circled in red above). Click the bookmarklet buttton on your browser. A little coloured donut will appear in the top-right which gives you the altmetrics (see above). You can then click on it to get specific details about exactly which news stories have mentioned the article, who has shared it on Twitter etc. Altmetrics (PlumX) are also shown in the search results in Discovery and on Scopus. Again, you're looking for one of the two icons shown above. You can then click on 'plum print' to get specific details about exactly which news stories have mentioned the article, who has shared it on Twitter etc. Individual academics and students don't have the ability to be able to look up this themselves at the moment. However, the Library is investigating the possibility of getting this facility and may be able to assist. If you'd like to know more, please contact libraryresearch@port.ac.uk. When looking at which research has made a tangible difference in the real world, two indicators are how it's affected policy and patents. If you're using Altmetrics, if you can click on the coloured 'donut' icon you'll be taken through to a screen that looks similar to above. You can then click on the Policy Documents or Patents tabs to see this information. if you're using PlumX metrics, then click on the coloured 'plum print' icon, then look under the Citations area. Although altmetrics are useful, they should be treated with some caution. They are essentially a measure of the amount of 'attention' being paid to a piece of research. However, they do not show whether this attention is positive or negative. For example, an article could be mentioned many times on Twitter because it is bad! So when interpreting altmetrics, you need to explore beneath what the numbers actually mean. Please contact the Research Outputs team on libraryresearch@port.ac.uk. Or if you are interested in research impact, then please contact the University's Research Impact Officer, Dee Summers - dee.summers@port.ac.uk.